Queen are a British rock band formed in London in 1971, originally consisting of Freddie Mercury (lead vocals, piano), Brian May (guitar, vocals), John Deacon (bass guitar), and Roger Taylor (drums, vocals). Queen's earliest works were heavily influenced by progressive rock; in the mid-1970s, the band ventured into more conventional and radio-friendly works, bringing them greater commercial success. It also became something of a trademark to incorporate more diverse and innovative styles in their music, exploring the likes of vaudeville, gospel music, electronic music and funk. Brian May and Roger Taylor had been playing together in a band named Smile. Freddie Mercury (then known by his birth name of Farrokh, or Freddie, Bulsara) was a fan of Smile, and encouraged them to experiment with more elaborate stage and recording techniques. Mercury himself joined the band shortly thereafter, changed the name of the band to 'Queen' and adopted his familiar stage name. John Deacon was recruited prior to recording their first album. Queen enjoyed success in the UK during the early 1970s, but it was the release of Sheer Heart Attack (1974) and A Night at the Opera (1975) that gained the band international success. 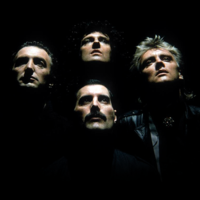 The latter featured "Bohemian Rhapsody", which stayed at number one in the UK charts for nine weeks. In 1991 Mercury died of bronchopneumonia, a complication of AIDS, and Deacon retired in 1997. Since then May and Taylor have infrequently performed together, including a collaboration with Paul Rodgers under the name Queen + Paul Rodgers. The band has released a total of 18 number one albums, 18 number one singles and 10 number one DVDs, and have sold over 150 million albums, with some estimates in excess of 300 million albums, making them one of the world's best-selling music artists. They have been honoured with seven Ivor Novello awards and were inducted into the Rock and Roll Hall of Fame in 2001.